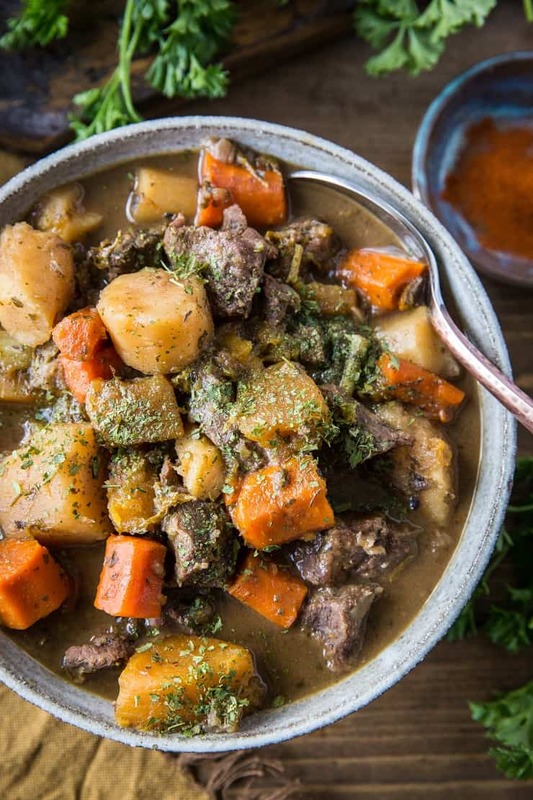 Hearty Instant Pot Beef Stew with carrots, parsnips, and butternut squash. 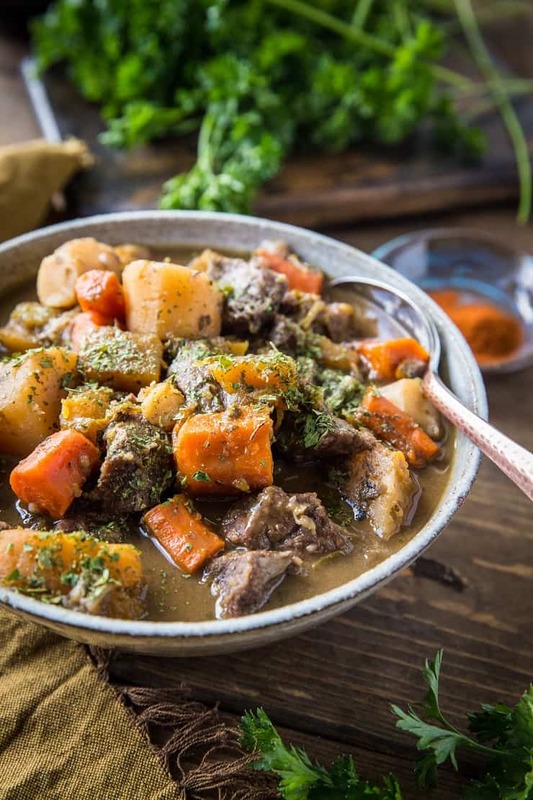 This potato-free stew recipe is filling, nutritious, paleo, whole30 and AIP-friendly. Not too long ago, one of my friends and I were discussing the types of ingredients our parents put in beef stew when we were kids. She remembered her dad once tossing in a bag of baby carrots, which just tickled me pink. Unbeknownst to me, some people add tomatoes to their stew, which I found to be enlightening since my family never added them. It’s always nice to compare and contrast those old family classics that bring about such fond memories. This particular friend stays away from nightshades (tomatoes, eggplant, potatoes, peppers, chilis) because they cause flairs in her autoimmune disease. She was saddened to tell me she no longer makes stew because she was accustomed to stews with tomatoes and potatoes. 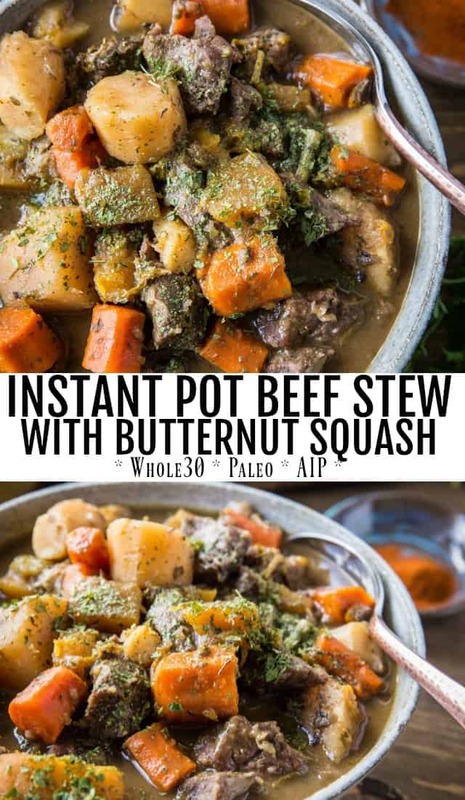 I let her know that by complete happenstance, I make a nightshade-free stew using beef, carrots, celery, parsnips, onion, and butternut squash. I find the combination turns out with such amazing flavor – no nightshades necessary for those who follow the AIP diet or are cognizant of their lectin intake. 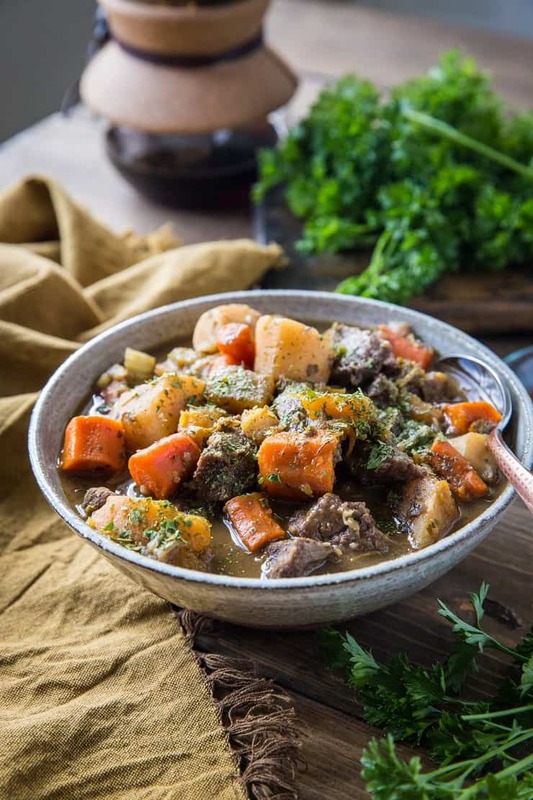 I have fond memories from childhood of my mom preparing beef stew in our ancient slow cooker…you know, one of the ones that really cook slooowly. She would set it up in the morning and we’d have the most beautifully flavored stew come evening. The tradition of making stew in the slow cooker holds that special warm fuzzy feeling of nostalgia for me. As a result, I began making my own Crock Pot Beef Stew not long after purchasing a slow cooker in my early twenties. And then the Instant Pot came into my world and rotated a couple degrees clockwise. I feel like a broken record when I say this, but I’m still amazed by the ability of the Instant Pot to produce such amazing meals in so little time. The same incredible meal is made in (conservatively) an hour and a half from start-to-finish. Sometimes I even think my Instant Pot recipes turn out with more developed flavor than my slow cooker meals, which again, baffles me silly! Case in point: Beef stew? Always a good idea. 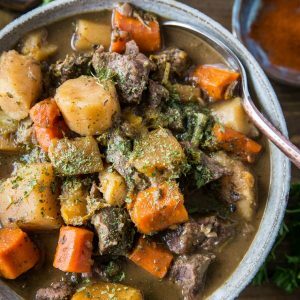 Instant Pot Beef Stew? Even better! Begin by sauteing the onion for a few minutes in the Instant Pot. Add in the beef and allow the meet to brown for a couple of minutes. Add the rest of the ingredients, set the Instant Pot to the Stew/Meat function and allow it to cook for 35 minutes. After the 35 minutes is up, allow the IP to naturally release for 30 minutes. Release the lid, stir, and serve! Add 3 chopped vine-ripened tomatoes if you like tomatoes in your stew. Sub any hearty vegetable for the butternut squash, carrots, or parsnips. Sweet potato, turnip, acorn squash, pumpkin, rutabaga, or russet or gold potatoes work great. Omit the onion and garlic for Low-FODMAP. Substitute chicken broth for the beef broth. Add ⅓ to ⅓ cup dry red wine, such as cabernet sauvignon or Malbec. Serve it up as is or with your favorite crusty gluten-free bread, cornbread, and/or even a dollop of coconut milk yogurt on top. All fall and winter long! Turn on your Instant Pot, add the avocado oil, and press the Saute function. Add the chopped onion and saute, stirring occasionally, until onion is transluscent, about 5 minutes. Add the beef stew meat and brown 1 to 2 minutes (do not cook through). Add the remaining ingredients for the stew and stir well. Secure the lid on your Instant Pot and press the Stew/Meat button. Adjust the time setting to 35 minutes. Set to Sealing. Once the stew has finished cooking, allow it to naturally vent until it completes its cycle (about 30 minutes). Add oil to a skillet and heat over medium. Add the onion and saute until translucent, about 5 minutes. Add the stew meat and brown for 2 to 3 minutes. Transfer onion and beef to your slow cooker along with the rest of the ingredients for the stew. Stir well and secure the lid on your slow cooker. Cook on low 6 to 8 hours, until beef is nice and tender. Can we freeze left overs? ‘’Venting”?? Do you mean “sealing” ? Pressure cook it right? It would be great if you could actually edit the recipe to correct this and not assume people will read the comments. Hoping my dinner isn’t screwed up now…. Simple recipe and very good! Thanks Julia. Love your blog!